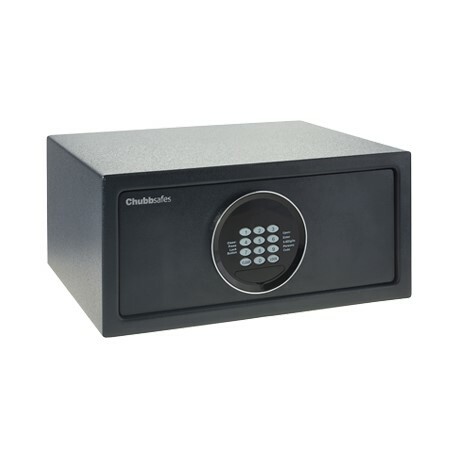 ​Protect your customers’ valuables while providing a user friendly safe: Air Hotel from Chubbsafes range is a compact safe providing elementary burglary protection for hotel environments. You want an effective yet adaptable safe for valuables and vital documents stored for safekeeping in hotel rooms, student residences or other high-turnover accommodations. As part of the Chubbsafes hotel safes range, Air Hotel offers the basic burglary protection you need in a compact size. Air Hotel is fitted with an user-friendly electronic lock which makes use very simple and comfortable. User-friendly electronic lock with LCD display. Codes are set by users when closing the doors with new codes set after the door is left open. The lock also provides an audit trail features and a programmable master code, as well as a mechanocal override key to open the safe in case of battery failure.